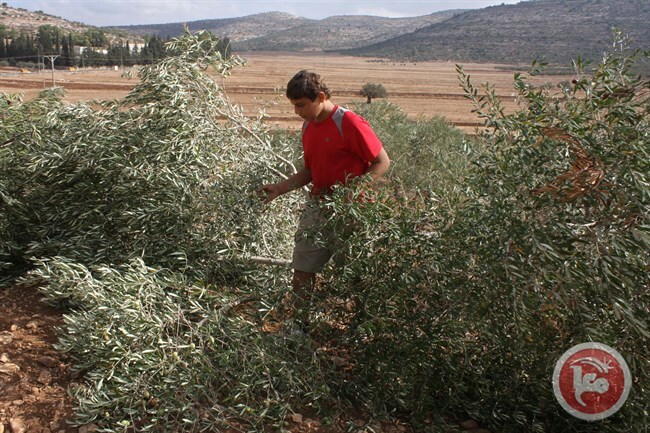 BETHLEHEM (Ma’an) — Israeli settlers on Saturday morning cut down 18 olive trees belonging to a Palestinian family in the village of Nahalin, west of Bethlehem in the southern occupied West Bank. Journalist Hani Fanun, whose family owns the trees, said his family went to harvest olives on their land in the Wadi al-Hariq area of Nahalin, and found that settlers from the nearby illegal Gush Etzion settlement bloc had cut down over 18 large olive trees. Fanun told Ma’an that the family’s land is closest to the Bat Ayin settlement — which is part of the cluster of Israeli settlements that make up the Gush Etzion bloc — and was reclaimed by the family after an order by the Israeli Supreme Court proved that it belonged to them. The Fanun family’s land, which spans 10 dunams, is surrounded by lands that were confiscated and turned into nature areas for the settlers of Gush Etzion. A spokesperson from Israel’s Coordinator of Government Activities in the Territories (COGAT), the group responsible for implementing the Israeli government’s policies in the occupied West Bank, said they were looking into the matter. This year’s olive harvest season, which began early this month, has seen several incidents of attacks by Israeli settlers on Palestinian farmers and their lands in the occupied territory. On Friday, Israeli forces expelled several Palestinian farmers from their lands, and detained one while they were picking olives near Nablus in the northern occupied West Bank. Two weeks ago, dozens of extremist Israeli settlers harassed Palestinian families who were picking olives on their private lands west of Nablus city. Palestinian officials told Ma’an at the time that settlers from the illegal Israeli outpost of Havat Gilad “attacked” different families from the villages of Jit and Farata in the Qalqiliya district, and Sarra in the Nablus district — all located just south of the outpost. One week prior to that incident, a number of settlers from the illegal Eli settlement attacked Sahir Mousa and his family while they were picking olives on their land in the outskirts of the Nablus-area village of Qaryut, which is just a few kilometers away from the settlement. “They arrived carrying hatchets and other sharp tools and forced the family to return home and completely damaged their car,” officials said regarding that attack. On Oct. 4, a group of Israeli settlers’ children escorted by Israeli forces harassed a Palestinian family harvesting olives in the southern occupied West Bank city of Hebron. The Palestinian government has no jurisdiction over Israelis in the West Bank, and violent acts carried out by Israeli settlers often occur in the presence of Israeli military forces, who rarely act to protect Palestinian residents. Israeli human rights group Yesh Din, along with Israeli rights group B’Tselem, have previously condemned Israeli authorities for failing to protect Palestinians from settlers violence or investigate attacks, particularly during olive harvest season, when incidents of attacks on harvesters and their olive groves have been a near daily occurrence in past years.